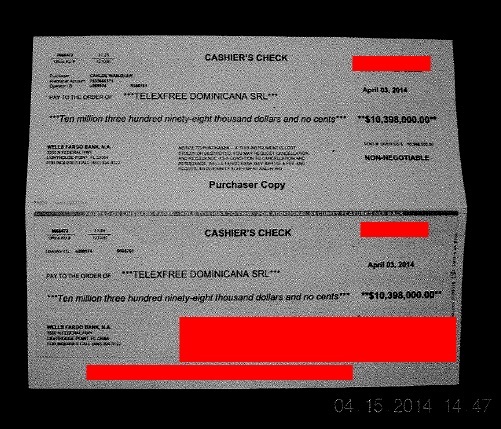 This check for nearly $10.4 million is dated April 3, 2014, and is made out to TelexFree Dominicana SRL, according to an SEC exhibit. Redactions by PP Blog. EDITOR’S NOTE: See story from earlier today on the SEC’s complaint and fraud allegations against the TelexFree “program,” executives and key promoters. A Bristol County Deputy Sheriff at the scene of a Tuesday raid by the Department of Homeland Security at TelexFree headquarters in Marlborough, Mass., stopped nearly $38 million in cashier’s checks from leaving the premises in a “bag,” the SEC says in court filings. On Wednesday, a federal judge froze the money, securing “millions of dollars of funds” and preventing “the potential dissipation of investor assets,” the SEC said. Joseph H. Craft, TelexFree’s chief financial officer, was at the scene Tuesday and attempted to grab “a laptop and bag,” asserting that he was a TelexFree “consultant” assisting with the firm’s bankruptcy and that the items were “personal items,” the SEC said in an affidavit. Craft, 50, of Boonville, Ind., is a defendant in the SEC’s TelexFree action announced earlier today. He and several other defendants are accused of fraudulent or deceptive conduct in connection with the purchase or sale of securities, fraud in the offer or sale of securities and the offer or sale of unregistered securities. He is a certified public accountant, has prepared financial statements for TelexFree and has worked for other MLM companies, the SEC said. TelexFree, the SEC said, was a massive pyramid scheme that may have more than $1.1 billion in liabilities. The SEC complaint also references American MLM attorney Gerald Nehra, though not as a defendant. The product, the SEC said today, was a VOIP system used to mask a massive pyramid scheme that collapsed. And the video appeared after a TelexFree-related probe in Brazil had begun, according to the SEC complaint. Carlos Costa, another TelexFree figure not named a defendant in the SEC action, also was referenced in the SEC complaint. Costa is based in Brazil, where an arm of TelexFree has been under investigation amid pyramid-scheme allegations since at least June 2013. I recognized the red blocks. The original PDF, available on the Boston Globe web site does not have the red blocks. Ethan is a fellow scambuster, FYI. Thanks for letting me know, Tony. This should definitely be a wake up call to some people. I think what shocks me more is some people still are trying to push this company/program. I am still seeing it promoted. Not sure how though.